The introduction of feeding in policies such as Net Metering/Billing into the Caribbean electricity markets is hoped to trigger a significant influx of grid connected solar systems, similar to the response observed in Germany, Japan, USA and other parts of the word. Notwithstanding the continued dispute over whether the Net Billing concept will provide sufficient financial incentive to draw a significant number of investors, it stands to reason that individual investors should not view this initiative as only a financial instrument, but also as an opportunity to reduce their carbon footprint and at the same time their energy cost while recovering the capital laid out in the project, thus shortening the payback period. There is no time better than now to start the process of integrating large amount of solar systems into the electric grid. At present solar constitute only a small portion of global energy production despite the enormity of this natural resource compared to current resources in use. The earth receives more energy from the sun in one hour than global energy use in a year. Despite its high cost today, Solar photovoltaic (PV) is the fastest growing renewable energy industry, sustaining an annual growth rate of more than 40% for the last decade. Climate changes, the adoption of state level renewable energy portfolio and incentives, and the accelerated reduction in PV system cost are some of the main reasons for the recent steep growth rate in the solar energy market. The objective of this article is to give the reads an insight into the basics of solar systems. First and foremost there are two main types of solar systems; 1) photovoltaic (PV) systems and 2) concentrating solar power (CSP) systems. These two technologies both use the sun to generate electricity, but in different ways. 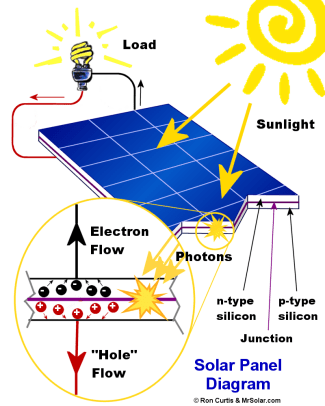 PV systems, otherwise known as solar electric systems, use semiconductor material to convert sun light directly into electricity. CSP systems on the other hand, described as solar thermal electric systems, use mirrors to concentrate the thermal energy to heat fluids that can be used to drive turbines, which in turn produce electricity. As previously stated, PV and CSP systems both use the sun to generate electricity, but they use different forms. The sun light reaching the earth’s surface is of two forms direct or diffused. Direct sun light is unobstructed radiation from the sun that shines perpendicular to the plan of the solar device. This form is used by CSP system and concentrating PV systems, in which the focusing of sunlight is essential to the electricity generation process. Flat plate PV systems can also use direct sunlight. The other form of solar radiation, diffuse sunlight, is sunlight that reaches the earth’s surface after passing through thin cloud covers or reflecting off particles or surfaces. Global radiation is the sum of direct and diffuse components of sunlight and this global radiation as well as direct or diffuse radiation alone can be used by flat plate PV systems to generate electricity.